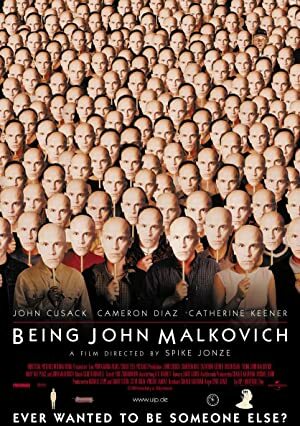 Being John Malkovich (1999) – What's New on Netflix Canada Today! Craig, a puppeteer, takes a filing job in a low-ceilinged office in Manhattan. Although married to the slightly askew Lotte, he hits on a colleague, the sexually frank Maxine. She’s bored but snaps awake when he finds a portal leading inside John Malkovich: for 15 minutes you see, hear, and feel whatever JM is doing, then you fall out by the New Jersey Turnpike. Maxine makes it commercial, selling trips for $200; also, she’s more interested in Lotte than in Craig, but only when Lotte is inside JM. JM finds out what’s going on and tries to stop it, but Craig sees the portal as his road to Maxine and to success as a puppeteer. Meanwhile, Lotte discovers others interested in the portal.